TO CRUISE AT 175 M.P.H. В 1933 году для австралийского и канадского рынков компания "Blackburn" спроектировала восьмиместный пассажирский самолет Segrave III. Заказов на него не поступило, но он стал базой для создания С.А.19/1 (HST.8 - высокоскоростной пассажирский № 8), а затем ДальшеMore>>> для 10-местного С.А.21, который предлагался также для воздушного наблюдения. С.А.21 тоже не привлек внимания покупателей, но использовался как основа при создании более крупного С.А.21А (HST.10), оснащенного убирающимся шасси, закрылками с гидроприводом и двумя Н-образными двигателями Napier Rapier. Затем "Blackburn" разработала неудачный военный вариант СА.21А, обозначенный С.А.21В. В августе 1934 года "Blackburn" выпустила прототип нового самолета В-9. В нем применили новинку - трубчатый дюралевый лонжерон конструкции Ф. Данкенсона, центральная часть которого служила топливным баком. В-9 имел цельнометаллический каркас, обшитый дюралевыми листами, за исключением киля и рулевых поверхностей, обтянутых тканью. Самолет В-9 являлся свободнонесущим низкопланом с убирающимся шасси и фюзеляжем типа полумонокок овального сечения; кабина экипажа отделялась от салона. Постройка В-9 задерживалась из-за медленной поставки материалов и давления со стороны правительства, принуждавшего "Blackburn" выпускать военные самолеты. Прототип был готов к середине 1936 года, но от проекта отказались. В 1939-1946 годах самолет использовали как учебное пособие, а затем сдали на металлолом. Проектировались и военные варианты В-9, в том числе бомбардировщик-разведчик и транспортный самолет HSBT.10, дальний бомбардировщик HST.20 и самолет общего назначения HSNT.10. IT has been known for many months that the Blackburn Company has had under construction something quite out of the ordinary in the way of commercial aircraft, and Flight is now able to give an advance description of the machine. The H.S.T. 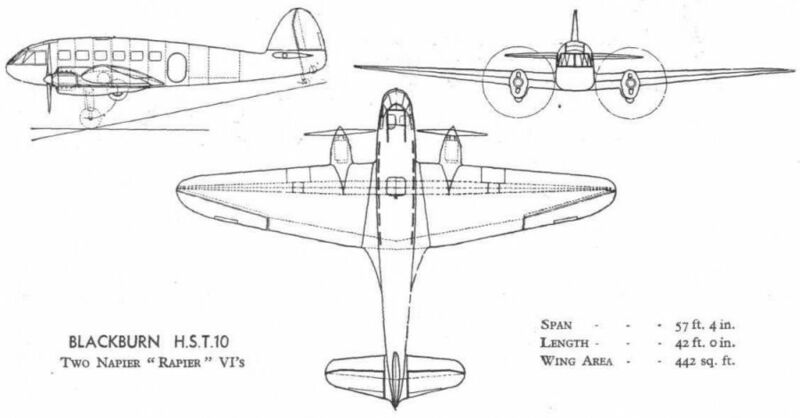 10, which is the Blackburn works number of the new aeroplane, is a twin-engined low-wing cantilever monoplane of metal construction, employing a Blackburn-Duncanson single-spar wing. Whilst high speed has been considered of first importance, and has been achieved by careful attention to body form, elimination of all unnecessary excrescences, retraction of undercarriage and tail wheel and adoption of novel forms of construction, it is claimed that this object has been attained without sacrifice of comfort and safety of passengers or economy of operation and maintenance. 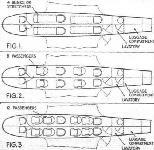 Intended primarily for passenger transport, the aircraft has accommodation for alternative loads up to a maximum of twelve passengers and two pilots, with a range of 320 miles. 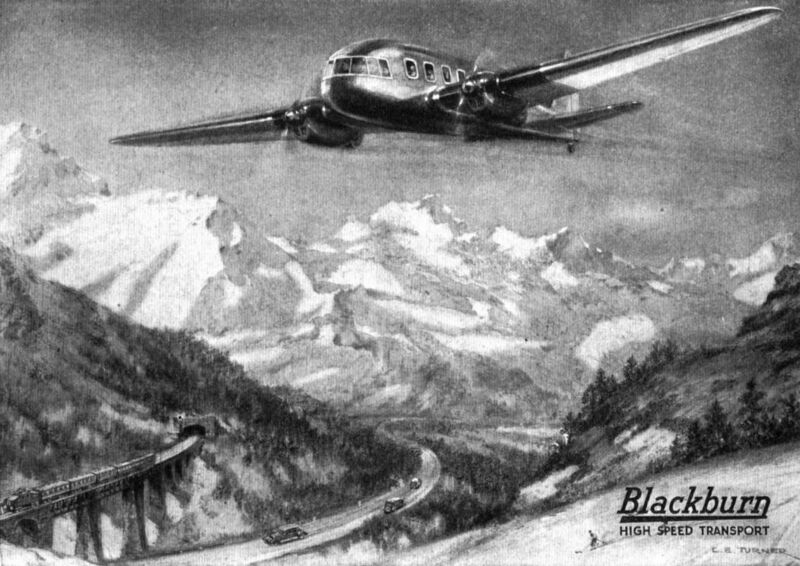 For long-distance operation the range may be increased to 1,000 miles with five passengers and two pilots. Alternatively, the cabin space is adaptable to a great variety of purposes, including mail and freight transport, photography and air survey, and ambulance and first-aid work. Compared with the conventional type of two-spar wing, the Blackburn-Duncanson single-spar structure is claimed to effect a considerable reduction in weight, giving a corresponding increase of payload. It is exceptionally stiff both in torsion and bending, thus obviating risk of flutter. The spar, which is of tubular form, is employed as the fuel tank, thereby saving the weight and space of separate tanks with their mountings. Rigging maintenance is eliminated, and the simplicity of construction, small number of parts, and freedom from structural complication should save time and expense in routine inspection and maintenance. In the event of a forced descent into water the spar should assist towards keeping the aircraft afloat. Built as a single detachable unit, the wing is of tapered form. The Blackburn-Duncanson spar is constructed in three sections, the central portion constituting the fuel tank, and is of duralumin construction. 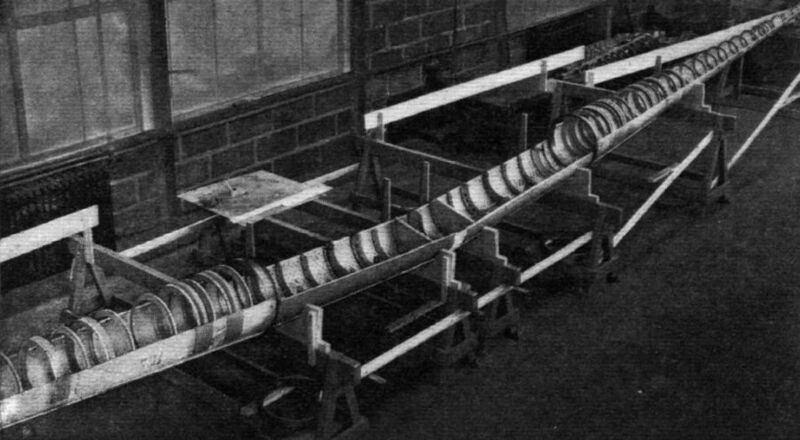 Girder-type ribs of duralumin tubular sections are employed. The ailerons are both aerodynamically and mass balanced, and their control mechanism is enclosed completely within the wing. Hydraulically operated trailing-edge flaps are provided. A cantilever monoplane tail plane of duralumin construction is employed; it has interconnected elevators, aerodynamically and mass balanced, and is fitted with an easily adjustable trimming device. The fin and rudder are of conventional design and constructed of duralumin, the rudder having a back-set hinge type of balance. Monocoque-type construction is used for the fuselage, which consists of transverse frames, longitudinal stringers and shell plating of Alclad. The clean lines of the fuselage may be seen in the general arrangement drawings, which show also that the attachments of the wing, tail plane and fin are well filleted to eliminate interference. In the extreme nose of the fuselage is the pilots' cockpit, which accommodates two pilots placed side by side with adjustable seats. A transparent sliding roof and sliding side windows are provided for the cockpit, the top sliding panel being fitted with a sun blind. The passenger cabin is separated from the pilots' compartment by a partition with a communicating door. It is 18ft. long, 4ft. 4in. wide, and has an average height of 5ft. 6in., giving a capacity of 352 cubic feet. The seats are arranged in pairs facing forward with a central gangway and collapsible tables, light luggage racks being provided for the convenience of passengers. Noise and variations of temperature are reduced by the insulation of the cabin walls. Ventilating and heating systems are installed, with separate ventilation controls for each passenger, and there are side windows of ample proportions. A door gives access to the rear of the cabin on the port side. 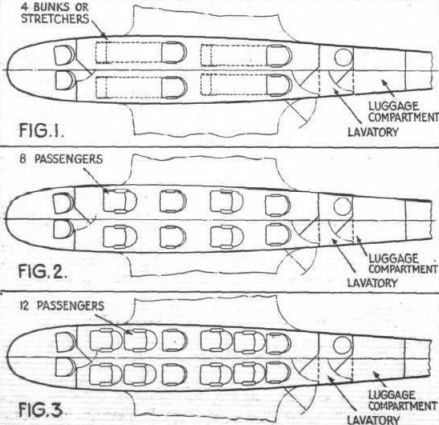 Behind the passenger cabin is a lavatory with a capacity of 33 cubic feet, and further aft is the luggage compartment, which is 37 cubic feet in capacity. As stated previously, a retractile undercarriage is fitted, this consisting of two separate units, one beneath each engine nacelle. Medium-pressure air wheels are employed, and are provided with Blackburn oleo-pneumatic struts. The retracting mechanism is operated hydraulically and is protected from mud by covers which can be removed for inspection. A large indicator showing the position of the undercarriage is mounted conspicuously on the pilots' instrument board, and an automatically engaged warning device assists in preventing the pilot from attempting to land with the wheels in the retracted position. Independently operated wheel brakes are fitted as standard. The tail wheel is also retractile, and is of the free castor type sprung by an oleo-pneumatic strut; the wheel is of the low-pressure type. A central column with a "spectacle"-type handle (which may be swung over to the seat of either pilot) and two parallel-action adjustable rudder bars form the flying controls. Longitudinal and directional trimming gear is also provided, the latter being adequate to prevent yaw with one engine stopped. The flap control is placed between the pilots' seats. Two Napier "Rapier" VI moderately supercharged sixteen-cylinder "H"-type air-cooled engines are carried on steel tubular mountings on the wing spar; they drive two-bladed airscrews. These engines are enclosed in nacelles faired into the wing and fitted with detachable cowling. The whole of the engine installation and petrol and oil systems are fully accessible for maintenance, and replacement of an engine is easily effected. The H.S.T. 10, the new high-speed commercial monoplane is rapidly taking form in the Blackburn works. The point at which the Duncanson single spar for the wing is offered up into the fuselage will be noticed. Fitted with two Napier "Rapier VI" engines, the machine is expected to have a cruising speed of 175 m.p.h. TAKING SHAPE : The single spar for the Blackburn-Duncanson H.S.T.10 monoplane described in Flight of November 29, 1934, is one of the components now nearing completion. The central portion of the built-up tubular spar forms the petrol tank, so that the weight of separate tanks is saved. Speed without sacrifice of passenger comfort is the chief objective in the design of the H.S.T.10. Some alternative seating arrangements provided for in the design of the Blackburn H.S.T.10.